Everyone was stirring—after all, they were a festive sort. There were presents to buy, and stockings to be hung. “We will never finish in time,” Seaporters yelled at the top of their lungs! Don’t fret, neighbors, and put your mind at ease. This weekend’s Boston Christmas Fest makes the holidays a breeze! Will be on hand for everyone to buy, sample, and feast! It’s never too early to have some holly, jolly fun and sing “Rudolph the Red-Nosed Reindeer.” Head across the street to the World Trade Center this weekend for the 30th Annual Boston Christmas Festival! 300 of America’s greatest craft artists will be on hand to help you prep for the holidays by offering great deals on home accessories, artisan jewelry, festive décor, and gourmet goodies! Make the holidays a breeze instead of a headache by enjoying one-stop shopping at this annual event. Whether you’re wanting to be the host with the most or looking for stockings to hang from the chimney with care, all the essences of the season will be there! 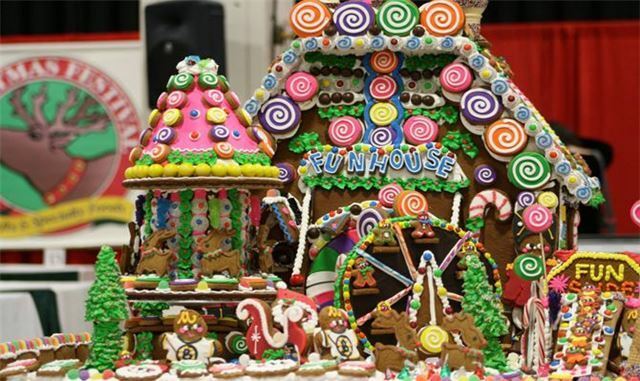 Pop by the gingerbread house competition for the best in cookie construction by some of the city’s top chefs! Proceeds benefit Housing Families, a non-profit organization dedicated to ending family homelessness.